Yesterday, when these pictures were taken, began as the second consecutive warm pleasant day. Thunder and rain gave way to unpleasant cold. Overnight frost was missed by just two degrees. 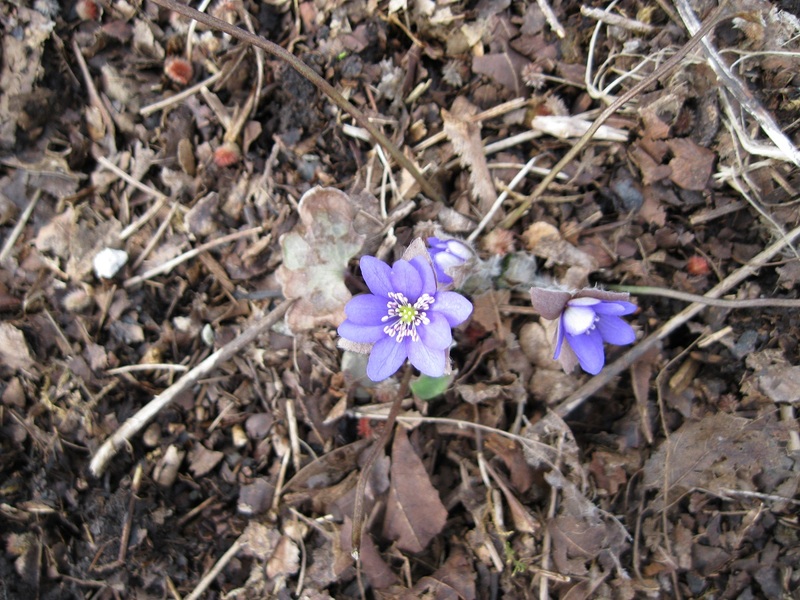 These Round Lobed Hepatica flowers are the first of our native plants to bloom. Three were purchased last year at Catskill Native Nursery and all are still with us. This plant's flowers before leaves habit give us a local story of interest. A neighbor that built his house on the western edge of the Batterson Farm firmly tells the story of his discovery of a purple flowered Arbutus. Arbutus carries its dark green leaves beneath snow cover and its white or pink blossoms are still a few weeks from opening. Out in his woods early in the year, he saw purple flowers nestled among the evergreen Arbutus leaves. It certainly looked like that Arbutus did indeed have purple flowers. Since that plant was reported as quickly stolen, no one else had a chance to see that unusual sight. 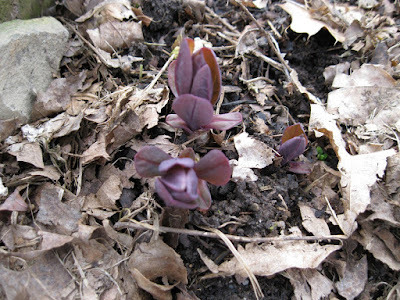 One of our Hepatica plants appears mature enough to divide. This Fall we will attempt division and place one under light Arbutus growth. We will not be able to share the resulting purple flowered Arbutus with our neighbor since unfortunately he has lost his eyesight. He will however be able to hear that his discovery made years ago remains alive and well near where he first found it. Last year two Bleeding Heart plants were purchased in Norwich and placed at either end of the bench in our newly developing shade garden. Both flowered and one has made an appearance this year. It appears that we will have a large native plant flowering close to the bench. Later this year we will likely see a photo of Becky sitting on her bench surrounded by native flowers. This Virginia Bluebells plant is also in its second year with us. It too was purchased at Catskill Native Nursery last year. Our memory says that it did not flower during its first season with us. 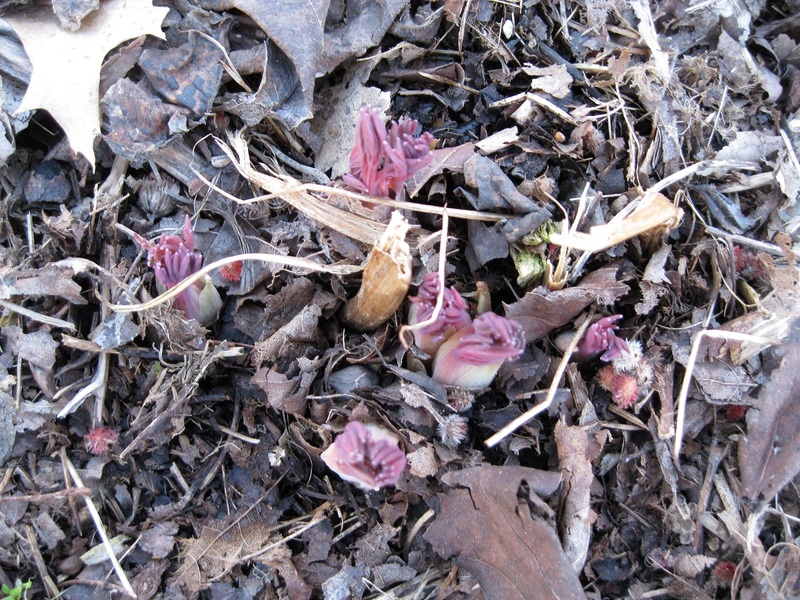 It looks like this strong new growth just might produce flowers this year. Either way we will not be disappointed since the plant remains alive. It is easy to see why these nonnative plants are widely popular. 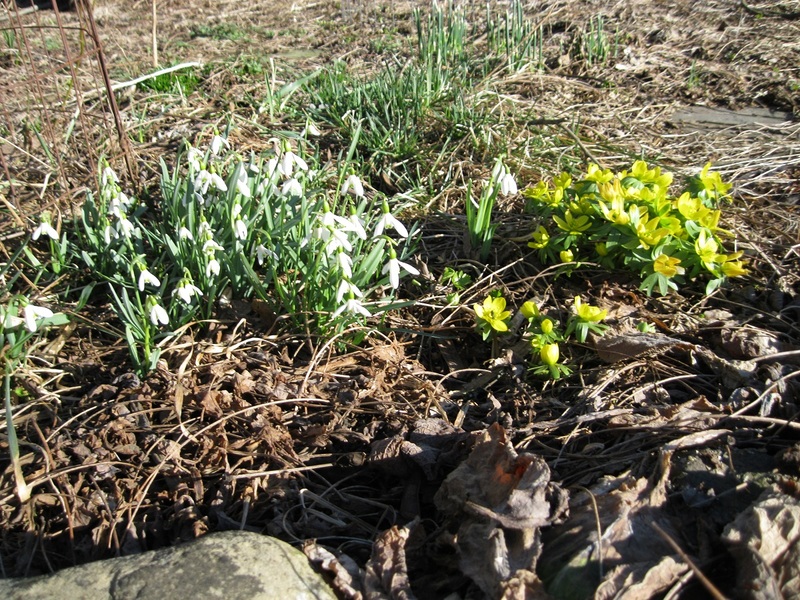 Snowdrops frequently open their white flowers while snow remains on the ground. They reseed freely with large clumps proudly holding garden ground. Winter aconites also frequently flower surrounded by new snow. Their yellow flowers certainly catch the eye even when they are surrounded by brown dead leaves. These plants are in the shade garden near the house although some of the Snowdrops have been transplanted in the developing garden down near the road. Aged hands do not respond well to working in cold soil when the air temperature remains in the 30's so this post represents today's gardening activity. 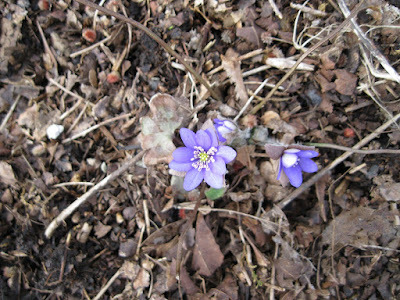 Hepatica, Arbutus, and Mertensia--some of my favorites! It looks like your garden is at a similar stage as mine. We got a bit of snow today, but we missed the bulk of the blizzard. Rain tonight through tomorrow. Happy spring!